Arthur Christopher John Soames, Baron Soames, GCMG, GCVO, CH, CBE, PC (12 October 1920 – 16 September 1987) was a British politician, a member of the Conservative Party and son-in-law of Winston Churchill. A European Commissioner and the last Governor of Southern Rhodesia, he was previously the Member of Parliament (MP) for Bedford from 1950 to 1966. He held several government posts and attained Cabinet rank. Soames was born in Penn, Buckinghamshire, England, the son of Captain Arthur Granville Soames (the brother of Olave Baden-Powell, World Chief Guide, both descendants of a brewing family which had joined the landed gentry) by his marriage to Hope Mary Woodbine Parish. His parents divorced while he was a boy, and his mother married as her second husband Charles Rhys (later, 8th Baron Dynevor), by whom she had further children including Richard Rhys, 9th Baron Dynevor. Soames was educated at West Downs School, Eton College, and RMC Sandhurst. After military service during the Second World War, Soames served as the Assistant Military Attaché in Paris. He was the Conservative Member of Parliament for Bedford from 1950 to 1966 and served under Sir Anthony Eden as Under-Secretary of State for Air from 1955 to 1957 and under Harold Macmillan as Parliamentary and Financial Secretary to the Admiralty from 1957 to 1958. In the 1955 Birthday Honours he was invested as Commander of the Order of the British Empire (CBE). In 1958 he was admitted to the Privy Council. He served under Macmillan as Secretary of State for War (outside the Cabinet) from 1958 to 1960 and then in the Cabinets of Macmillan and his successor Sir Alec Douglas-Home as Minister of Agriculture, Fisheries and Food from July 1960 to 1964. Home had promised to promote him to Foreign Secretary if the Conservatives won the 1964 election, but they did not. Between 1965 and 1966, Soames was Shadow Foreign Secretary under Edward Heath. He lost his seat in Parliament in the 1966 general election. In 1968 Harold Wilson appointed him Ambassador to France, where he served until 1972. During his tenure as ambassador, he was involved in the February 1969 "Soames affair", following a private meeting between Soames and French president Charles De Gaulle, the latter offering bilateral talks concerning partnership for Britain in a larger and looser European Union, the talks not involving other members. An offer the British government eventually refused and that for a time strained Franco-British relations. In 1972 Soames was subsequently made a Knight Grand Cross of the Royal Victorian Order (GCVO), a Knight Grand Cross of the Order of St Michael and St George (GCMG), and a Grand Officer of the French Legion d'Honneur. He was then a Vice-President of the European Commission from 1973 to 1976. He was created a life peer on 19 April 1978 as Baron Soames, of Fletching in the County of East Sussex. He served as the interim Governor of Southern Rhodesia from 1979 to 1980, charged with administering the terms of the Lancaster House Agreement and overseeing its governmental transition into Zimbabwe. From 1979 to 1981, he was Lord President of the Council and Leader of the House of Lords under Margaret Thatcher concurrent with his duties in Rhodesia. In 1980, he was invested as a Companion of Honour. The Hon. Emma Mary Soames (b. 6 September 1949) – editor of Saga magazine. The Hon. Rupert Christopher Soames (b. 18 May 1959). Lord Soames died from pancreatitis, aged 66. 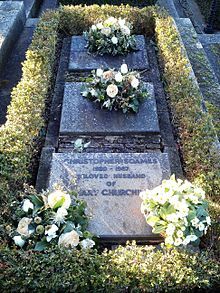 His ashes were buried within the Churchill plot at St Martin's Church, Bladon, near Woodstock, Oxfordshire. ^ "The Papers of Baron Soames". Janus Library, Cambridge. Retrieved 10 November 2014. ^ "No. 40497". The London Gazette (Supplement). 9 June 1955. p. 3269. ^ "No. 44723". The London Gazette. 26 November 1968. p. 12676. ^ "No. 45876". The London Gazette (Supplement). 11 January 1973. p. 480. ^ "No. 45554". The London Gazette (Supplement). 1 January 1972. p. 4. ^ "No. 45713". The London Gazette. 27 June 1972. p. 7689. ^ "No. 47519". The London Gazette. 24 April 1978. p. 4731. ^ "No. 48212". The London Gazette (Supplement). 14 June 1980. p. 5. ^ "Person Page 10626". Thepeerage.com. Retrieved 5 February 2013. Claire Sanderson, Perfide Albion ? L’affaire Soames et les arcanes de la diplomatie britannique, Paris, Publications de la Sorbonne, 2011. This page was last edited on 14 April 2019, at 12:27 (UTC).